Metro station and platform at Chandpole ready ! Construction of first platform of underground three stories metro station at Chandpole is complete. This platform is made by Dyefrom wall technique. First part of station that is ticket window area will be constructed in three stories and its platform area will be constructed in two stories. Under this technique, after digging the land for station, fourside wall of six metre width and around 12.5 metre high has been constructed. This inside wall will ensure that the old buildings around the station will not collapse. After coming metro train on elevated track from Sindhi camp to Janana Hospital, it will enter underground tunnel from Police line. This tunnel is ready. There is a platform in tunnel. When the track will be constructed from Chandpole to Badi Chaupar then this tunnel will be constructed towards Badi Chaupar. After completing the construction of station till December 2012, traffic at Chandpole area will come in flow. 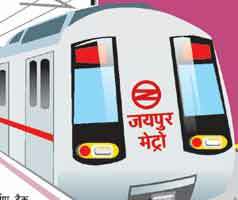 Next Post The First Line of Jaipur Metro Project is Complete !